Spiderman: Turn Off The Dark begins public performances tomorrow (Sunday in NYC). And I am very interested to see what this musical will be. I certainly will be scouring the vicious theatre blogs to see what the word is – knives will be out that’s for sure – they have already been sharpening! A show of this scale is bound to face huge criticism and curiosity. After a troubled technical period in which a couple of the performers during demonstrations of the shows flying sequences incurred injuries – one broke both his wrists, the other both his feet – OUCH! 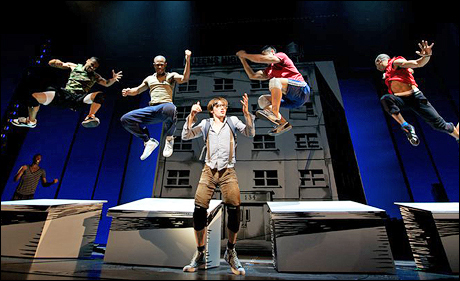 Previews were delayed and a new opening date set – Jan 11, 2011. 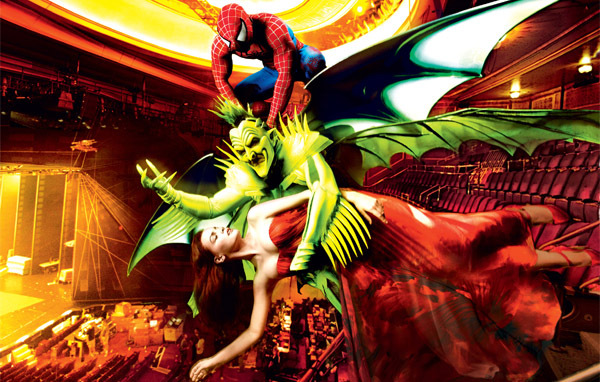 Directed by Julie Taymor, the cast is headed by Reeve Carney as Peter Parker/Spider-Man, Tony nominee Jennifer Damiano (Next To Normal)as Mary Jane Watson and Broadway veteran Patrick Page as Norman Osborn/The Green Goblin. Music & Lyrics is by Bono & The Edge (U2). We all know the story, now we want to see the spectacle. At a reported cost of $60 million dollars it had better be a worthy spectacle as it has an uphill climb and many many years to turn a profit. If anyone, Julie Taymor can pull it off – she certainly managed it with “The Lion King” still running on Broadway after 13 years, and still bringing in the bucks. I cannot believe that it will flop, in this current financial climate nobody would invest in a dog, but then again how could one know once all the creative juices flow and the compromising begins – it is extremely ambitious. Do those comic book nuts ever step foot into a theatre – let alone a musical one? I am excited, it ain’t Sondheim but it is a musical, and on a grand scale – needed every once in a while.